I broke my wrist again. The doctor looked at the x-ray and said, “Wow. It’s really a mess in there.” This, of course made me laugh because…really it’s inevitable that my right wrist is just going to completely fall apart at some point and his surprise just seemed funny to me. He casted my wrist and forearm and sent me on my way. It was later, sitting on my couch watching Law and Order reruns on my laptop that I started feeling sorry for myself. I try not to think too much about what the future brings for my dominant hand. I don’t like to think of myself as handicapped even though the accident in some ways, has left me with a nifty bag of tricks (coping skills) I have to use to succeed in my life. Since I’m off the hook (with myself) for crafty projects that were on my To Do list, like knitting myself and my girlfriend winter caps, perhaps I could practice my left handed drawings. To avoid more feeling sorry for myself, I could set up some plans in the evening with neighbors and friends. I could start working on improving my balance, which is something I’ve been meaning to do. I could use this 6 weeks as a giant immersion class in problem solving by keeping track of the obstacles and how I overcome them. I could use this experience to practice asking for help when I need it, which is not something I’m good at in my home life. But now I do need help. I need help getting a 30 pound bag of dog food out of my trunk! Practice writing left handed which is another thing I had been planning to do in a weird sort of planning for the day when writing normally will become problematic. Figure out ways to maintain healthy eating patterns and yet reduce all the chopping and dish cleaning I normally do. I think I like best the idea of using this experience as an intense immersion class in problem solving. There’s nothing better for exercising the part of the brain used for figuring stuff out than to take away the regular path of practice (using my right hand for writing, brushing my teeth, scrubbing a dish while I held it with my left). The neuropsychologist I saw after the accident told me everyone should be occasionally brushing their teeth with the opposite hand. It is a simple, yet, effective way of exercising your brain. Looking at my list, I realize that most of the items are just using the broken wrist for motivation, especially for things like improving balance. Improving balance has been on my To Do list for about 6 months. Falling on a hike in the Berkshires and breaking my wrist is a great motivator for undertaking that challenge. 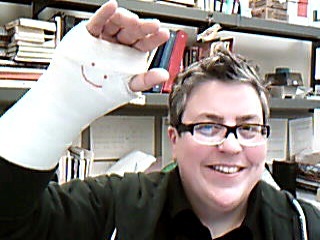 This injury is temporary; but, my wrist is problematic. It is falling apart and eventually I’ll go from limited range of motion to NO range of motion. Anything I learn now, about navigating life left handed and/or one handed is probably going to come in useful later. That’s how I try to turn a negative into a positive. How do you do it? In the workplace, as in your personal life, focusing on the negative is only going to leave you in a negative place. When something negative happens at work, how do you react? How can you change a negative into a positive? Learning something is usually a good way to go and sometimes leads to even greater success. I have a friend who, several years ago, was fired from her job. She was definitely freaked out and worried. But, do you know what she did? She started her own business and has found great success. She has won awards for her design work and has ridden out the recession without too much worry. Getting fired, seemingly a negative occurrence, turned out to have the single largest positive impact on her career outside of her schooling. When negative stuff happens, turn it upside down and all around and I can almost guarantee you’ll find a few shiny spots. If you’ve been reading CCS for awhile, you know I’m not big on blame. I’m big on the seeing there is a problem and coming up with solutions part of assessing failure. I am part of a listserv for my town. Mostly I skulk, keeping up on local news and happenings from a homeowner’s perspective. Recently there was an interesting discussion that was born out of a comment from a regular poster who informed the group that a local, boardwalk coffee/bakery shop had closed up. He made an offhanded comment about commercial rents going up on the boardwalk and mostly talked about the importance of supporting small local business in our fledgling little seaside community. After reading his post, I quickly had the following thought: Dude, rent had nothing to do with the failure of that business and everything to do with the horrible customer service and pissy attitude of the owner. I decided to reply to his post with a couple of anecdotes of my own experience as a customer at this shop, which sparked a fascinating discussion and saw a flood of very civil posts about customer service and just how much people were willing to take in order to keep small business flourishing and when it became just not worth it. This bakery by far had some of the best baked goods in NJ and probably one of the most divine macaroons I have ever eaten. His coffee was mediocre; but, there is no great coffee in Asbury Park; so, that was not surprising. But, this man, who owned the shop and worked behind the counter was just unpleasant, abrupt and on occasion, rude. The last time I had been in there was early this summer when I had a guest visiting from Oregon and she said, “ooh a bakery.” So, we went in. There were two people ahead of us in line and one of them asked for iced coffee which he began to retrieve from a refrigerator. As he held the door open he turned and said: Does anyone else want an iced coffee while i’m over here? He asked this question as if he was totally being put out. When the shop fell silent, he said: I guess that’s what they mean when they call me the coffee nazi; but, it just makes sense if i’m over here anyway. My friend looked at me and I shrugged. We got our treats, which were delivered brusquely with no thank you and walked out. My friend said, That was weird. I replied: I know. He’s always like that. I almost never go in there. Further down the boardwalk is a seasonal business called the Sandwitch. The owner is funny, warm and kind and this is all delivered while under pressure because her business is thriving and there were always lines and 2 or 3 more workers crammed into her little hut making sandwiches and smoothies and coffee drinks. I probably went there almost a dozen times until she closed for the season in October. I want to support small business in my community. I’d rather give my $$ to a person taking a risk on my town, contributing to it’s renaissance and what we in Asbury Park call, Buying In. But, you gotta give me something. Even a robotic thank you would have helped me support this guy. And now I’m back to the concept of blame. Apparently this owner believes that his business didn’t survive the economy, or at least that was what he said on the listserv. But, that is just not true. Here in Asbury Park we broke beach attendance records by something like 40% and my neighbor said she hadn’t seen the boardwalk as packed as it was on July 4th since the 6os, before AP’s decline. And to top it off, his product was excellent. New Jersey has a small but loyal foodie base that will get in their cars and travel for good food and their word on chowhound.com alone has probably saved more than one small business that didn’t get enough traffic the old fashioned way. This is a case where blame really does lie at the feet of the proprietor and if he can’t see where he went wrong I suggest he not try any more entrepreneurial pursuits. It is important when there is failure to swallow pride and really SEE the failure. Maybe it was just a bad idea. Maybe the key people were just not in roles they can succeed in. (The owner of the bakeshop put himself in the number one customer service role: counterman; but, he couldn’t meet the challenge. He should have hired someone with better skills.) Maybe you assumed too much about your customers. Failure is the time when tough questions should be asked; but, it is also when the slate gets cleaned in a way that really innovative ideas can come out of the rubble. If you roll out a new service in your library and it doesn’t get used or fails to meet projections, do you chalk it up as something the public just didn’t want or do you really assess the failure to find out exactly where you missed the target? Just maybe, you learned something in that failure that will help you better serve your community. Don’t assume, just because it’s a great service that they will come. In my library, we are talking about ways to promote the Playaway collection (self contained audio books) because we just aren’t getting the circulation statistics we want. We could just shut it down and reduce or eliminate the budget for them; but, maybe the failure is in our marketing or education of the public. Clearly we need to try a few things before giving up. Shine the light on your process before blaming the public. Bakery man might feel better about his failure if he blames the public: they just didn’t come regularly enough to sustain this business; but, he might have learned more if he listened to his customers and read the online reviews of his business, which were almost all praising his product and slamming his service. Get feedback from staff, from your customers, from anyone with an opinion and open your mind to it. It’s okay to fail; but, get something out of it or it truly is just failure.